by Kai Nealis William Shakespeare’s Macbeth has been adapted for the screen nearly 25 times in one way or another since its first short, silent rendition in 1908 by James Stuart Blackton. Among the most notable adaptations are the Indian crime drama revamp Maqbool, set in modern day Mumbai from director Vishal Bhardwaj, Roman Polanski’s grandiose 1971 rendition, Akira Kurosawa’s 1957 Samurai reconstruction Throne of Blood, and director Justin Kurzel’s take on the Macbeth story just last year. With over a century of Macbeth films to analyze, there is still something significant to be said for Orson Welles’s 1948 classic retelling of Shakespeare’s famous tragedy. The performances in Welles’s film have yet to be matched in subsequent renditions and without it as a reference, today’s interpretations would certainly be at a disadvantage. In Welles’s film, the wind is always whipping through the mountain ridges of the Scottish Isle. Visually, the film flourishes by eerily drifting through a wasteland of royalty and witches perched atop foggy rock cliffs. Welles himself described the story as “a perfect cross between Wuthering Heights and Bride of Frankenstein.” Nothing less is achieved in the striking cinematography and bold, ghostly performances by Welles himself, Jeanette Nolan, Dan O’Herlihy, Roddy McDowall and Edgar Barrier as they pace through dimly lit caves and in castle corners. Up in the clouds, where winter tree branches quake and where deceit and regret run wild, Macbeth and the Queen are always very evidently troubled. Almost everyone and everything in this film is shrouded in such trouble and darkness. The camera’s low-angle positionings further this theme of darkness, frequently depicting the characters against the looming grey skies above them. This production design — made up of the remains of Hollywood western sets — has the imposing, mysterious likeness of illustrators M. C. Escher and Chris Van Allsburg. Yet another point sharply posed in question refers to the Macbeth doll held by the three witches in the film’s opening and closing shots. This addition to the story, likely coming from Welles’s previous staging of what is now known as “Voodoo Macbeth,” shows his keen sense of the cinematic. In his earlier stagings of the Hatian and Caribbean island-themed Macbeth (which featured an all African-American cast), he was said to have taken many liberties in combining Scottish witchcraft with the classic tragedy of Macbeth. These productions clearly influenced his approach to the film adaptation. Whether it’s putting plot developments that were previously only alluded to on screen or having the cast speak in Scottish burrs, these decisions only make the film more cinematically rich. In this way, Welles’s direction of the action, camera, and actors is very astute. 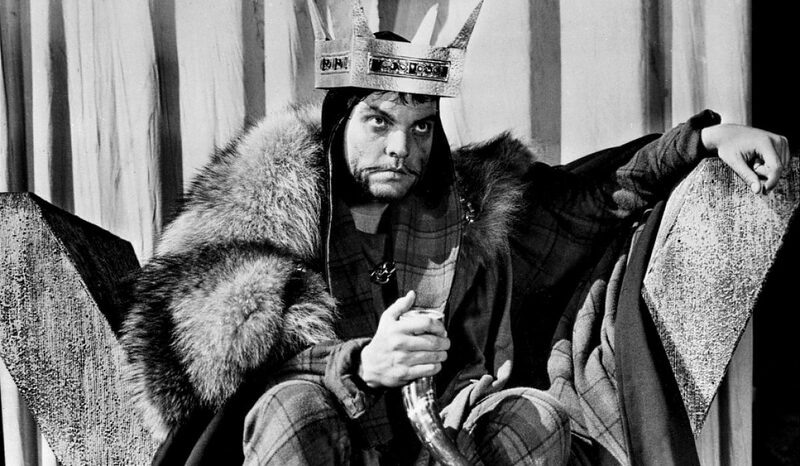 Made on an immensely limited budget and production schedule, Welles’s admirable take on Macbeth owes a lot to the liberties he took — a creative license not often utilized by filmmakers at the time when dealing with Shakespeare’s words. Welles also shot the film in an incredibly short period of time. In an interview he notes, “I thought I was making what might be a good film, and what, if the 23-day shoot schedule came off, might encourage other filmmakers to tackle difficult subjects at greater speed. Unfortunately, not one critic in any part of the world chose to compliment me on the speed.” Welles’s speed deserves recognition for several reasons, the first being that completing a film with such elaborate, impressionist sets and costume design would typically take more than double the time and budget that was spent on the production of this film. Moreover, one might expect the equally complex, ambitious camera movement in this film to take considerably longer to rehearse and execute. Consequently, with such intricate camerawork and a clearly very low number of takes, it’s no surprise that all of the film’s dialogue was prerecorded (presenting an additional extraordinary feat within the 23-day shoot). In every scene, Welles and his colleagues pantomimed their previously captured, stylized performances with great accuracy. Generally speaking, the question of how and why we put Shakespeare on film has shifted a great deal since the release of this film. We’ve moved from avoiding the constraints of the sensors and studios of Welles’s day to further condensing and adapting the words of Shakespeare to modern times. Amidst this shift, Welles was a pioneer and a visionary in bringing the story of Macbeth to life on film. Although he told his biographer Barbara Leaming that the film was “a bold charcoal sketch of the play,” I cannot help but disagree. His rendition is certainly characteristic of his filmography and work ethic and while there is no means of telling which cinematic renditions of his plays Shakespeare would most prefer, I wager that Welles’s Macbeth will continue to stand above its predecessors and emulators for many years to come. Tags: Kai Nealis, Shakespeare week 2016. Bookmark the permalink.